In general, the transition of CloudAhoy users to iOS 7 has been smooth. 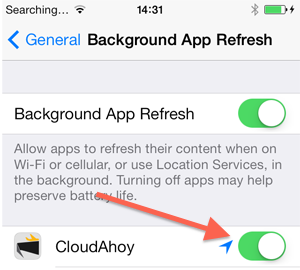 However, there is a setting in iOS 7, called Background App Refresh, which can hurt CloudAhoy’s logging. Symptom: you get nice green GPS lights after tapping START, but sometime later during the flight the logging stops. Reason: For CloudAhoy to log flights while working in the background, Background App Refresh must be enabled for the CloudAhoy app. Solution: Please check the settings on your iPhone and/or iPad. To allow CloudAhoy to log your flights in the background, the switch for CloudAhoy must be On (green). Even with the background app refresh on I’m having the interruption on the tracking always at the end of flight. This is only notice after the last update. Checking by another app and there isn’t any interruption. Please contact us (dev@CloudAhoy.com). We will try to figure out what’s going on. My last two flights had “Insufficient data” and did not debrief. Maybe that is what the problem was? Hi Kayak Jack. If you had Background App Refresh off, then it’s very likely that the tracking will be impacted. iOS simply does not allow CloudAhoy to run in the background and collect data.